Why did they Name as Selenium ? Couple of years back we had only one automation giant which is QTP ( currently known as UFT ). QTP was owned by company called Mercury, they were charging heavy for the QTP product. After years a program was developed by Jason Huggins a programmer at ThoughtWorks (still we can find couple of thought work pacakages in selenium webdriver if you have noticed), they wanted to name the program as something which gives opposite meaning to QTP, later they gave name Selenium. Selenium is Chemical mineral which cures the wounds caused by Mercury. 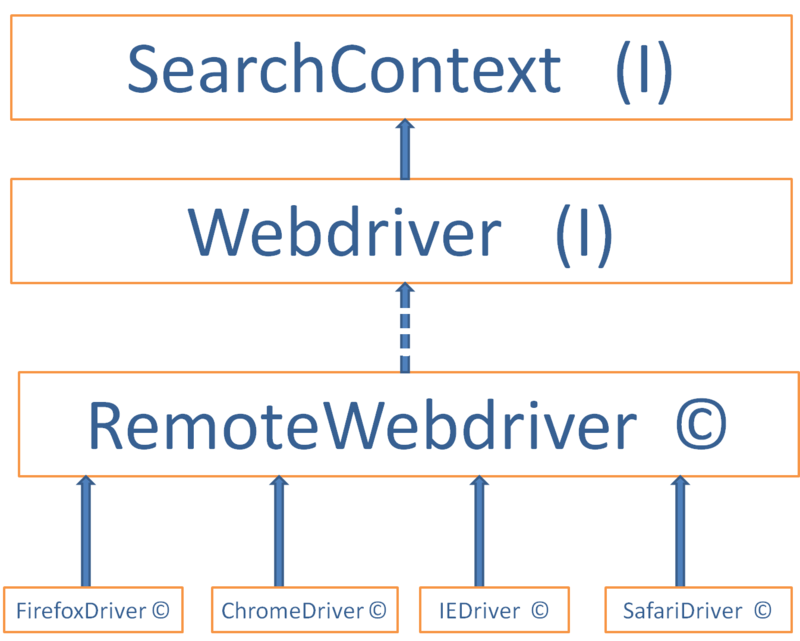 Search Context is top most interface in webdriver, Webdriver Interface extends the Search Context, Remote Webdriver class implements the Webdriver Interface, Browser classes (FirefoxDriver, ChromeDriver..) extends the Remote Webdriver Class. Selenium WebDriver imitates the real world user behavior as closely as possible. Since real world user is not able to interact with any invisible element or elements not rendered yet, neither does webDriver. So we need to always make sure that the web element is in right status before we try to interact with it. Same Origin Policy prevents a web site's scripts from accessing and interacting with scripts used on other sites. This is a problem though, because the browser is getting a script from Selenium(http://localhost:9000/selenium) which tells it that it wants to fetch resources from https://websitetotest.com. The browser says "hey this script came from local host and now it's requesting a resource from some outside website. This violated the same-origin-policy. Same Origin Policy With Selenium RC : Selenium RC tricked the browser by proxy, and browser considered that both webpage and server are from same host, so browser let the Selenium RC to run. Selenium Core : Consider you are the webpage, your manager/wife could be the server which tells you do this, do that. At somepoint your body realizes that no need to follow them, as these are not generated by your mind, this was the problem with Selenium Core. RC example : Someone hypnotized you and they are just asking you do to some job, and you are doing them this is selenium RC, hipnotization is nothing but the proxy. Webdriver : You have been told what to do, when something occurs from your childhood. Now you will do same thing even after becoming a adult. But you will never realize that you were doing something that someone taught you a long back. Only thing what you feel is, this the way of doing. The biggest difference between selenium 3.0 and selenium 2.x is,In Selenium 3, all the major browser vendors are providing their own WebDriver implementations (Apple, Google, Microsoft, and Mozilla) instead of being developed by Selenium project (Selenium 2.x) and because they know their browsers better than anyone else, their WebDriver implementations can be tightly coupled to the browser, leading to a better testing experience for you. Mozilla have made changes to Firefox that mean that from Firefox 48 user must use their geckodriver to use firefox browser, regardless of whether you're using Selenium 2 or 3. Selenium 3 is more mobile automation focused, may be in future Selenium replaces Appium or Appium replaces Selenium. Test same application on multiple environments, like test env and Live env. Is Selenium Future of Automation ? I believe that instead of looking into a Selenium automation career, you should aim at something bigger. Selenium automation is basically programming with an automation library so instead of becoming a specialist in a library, why not do that for the language? In selenium terms, Apache POI is a library, if you become very expert in that apache poi, do you think, you know everything, NO. Similarly Selenium is also an Library/Framework in the language(selenium framework is there in different languages). What is the name of someone who specializes in using a programming language? Ah, yes, a programmer. So why not aiming at being a programmer since then you have a lot of options? You could do test automation but not only with Selenium WebDriver but any other automation library or tool. Why bet your career on using one library? No one can tell if Selenium will be here in 5 or 10 years because no one has a ability to look into future. Maybe Selenium Project Manager(selenium's official dev team) will decide at some point that he does not want to manage the Selenium project and then the project’s quality goes way down. With low quality, less and less companies will use it and not many will need Selenium automation experts. Many companies will not have in the future dedicated staff for test automation, Developers will do some of it, dev ops will have a slice of the automation pie as well, maybe some testers will join in. What a good programmer combines the selenium with some open source Robotic Process automation tool, then every company will remove the test programmer as they anybody can drag and drop elements in RPA. 1. Selenium does not offer any certification. 2. Selenium was introduced for free, they support it for free. 3. Some folks in the technology field who have studied Selenium are selling it out, but which is not considered as a certification. 4. If you really want to do certification then do the certification on the Programming Language, which you use for selenium. 1. Becoming a Selenium automation expert in 4 months, I took almost 6 Years to become such a level and still learning. So stop becoming expert in 4 months, because you cannot do so. 2. Learning selenium for certification, because there is no such thing called certifications for selenium. 4. Believing a learning website as ideal for learning everything about a selenium, I own this site but I still suggest my reader to not to stick to this site as this site is replica of my views or learning on selenium. 5. Believing Selenium IDE is basic to Selenium Webdriver, Selenium IDE aka SIDE has no influence on Selenium Webdriver. 6. Not asking for help, I have seen people who are scared that If I ask this question then my senior or SME may identify me as guy donot have knowledge. Know this, knowledge is nothing but knowing the subject, but if you donot read or ask anyone, how you will know anything. Ask the expert/experienced guy. It can be utilized for regression, user interface, functional and UAT testing. Selenium partiality for Dialog boxes. Selenium doesn’t support built-in add ins assistance. Additional Tools Required for Generating Reports. New features may not work properly(with new browser driver executable like gecko, chrome functionalities like dragging mouse movement). Good tests require good coders. Yeah, I’m sure there are plenty of good developers automating web testing through Selenium. But for everyone’s benefit it’s optimal to have your best developers write product features and leave automation testing to lesser skilled people. Selenium test suites take too long to run. Write enough Selenium tests and your suite will take days to finish. No framework out there can make a browser run faster and Selenium has pretty cool support for grid that can run parallel tests on multiple computers. But very few people have actually set it up and again, it requires quite a bit of skill to keep that beast running. "Becoming a Selenium automation expert in 4 months, I took almost 6 Years to become such a level and still learning. So stop becoming expert in 4 months, because you cannot do so." I would say it actually depends on how much time and energy one spends. It does not matter if you have not been able to do it in 6 yrs. Nice and complete tutorial. Easy to understand.